IT'S SPORZ AT HOME ON A SUNDAY---AGAIN! We visit The Olympic Stadium/London Stadium for the very forst time just before Xmas and travel to 'new Wembley' in mid March to face Sporz! 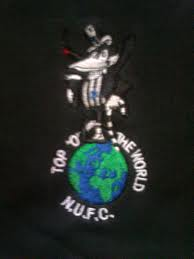 (Ne where near) Brightin=This groond iz 6 miles from the centre of their toon, in the middle of 'ne where'! The Liverbirds=It's the badge on their chests! The Arse=Their fans are complete 'arseholes' who want rid of their manager, despite winnin' the FA Cup 3 times in the last 4 years? Geordie Times copyright warning! : The above fixtures are under strict 'cryptic code' copyright to 'The Geordie Times and any infringements will be severely dealt with! We realise that this punishment is severe--but copyright MUST be protected!